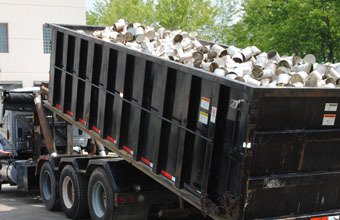 We work with our recycling partners to set up custom recycling programs that maximize efficiency and profitability. In addition to standard roll-off trailers in a variety of sizes, JaSar offers on-site pick-up using our specialized trailers with built-in elevators. A loading dock isn’t necessary, because our drivers are also skilled forklift operators. If the bales are accessible on the property, the driver will pick them up with our forklift and load them into the trailer. The elevator permits access to multiple levels within the trailer, thus maximizing efficiency and capacity. Contact a JaSar representative for a no-obligation evaluation of your company’s recycling needs. We recycle a full range of commodities at our plant, including fibers, plastics (#1–#7), glass, paper, ferrous metals and non-ferrous metals. Our inventory of products changes constantly. Click here for an updated listing.